I remember horseback riding through here on a regular basis when it was still just a vacant lot... We used to see coyotes on a regular basis and have great picnics under the Oak trees. For a brief time, I kept my horse in some persons backyard back in the late 70's. It was a 50's styled ranch house with pool and a long driveway that led past a riding ring to the paddocks. I've often tried to find it's location. I believe the driveway leading to the house was off of Hillcrest. I remember a nearby school (on Hillcrest). Also a Ralphs and Mc Donalds were down the street (6th?). At that time their was a trail from the backyard that circled back. Also a shared driveway that led to another house that seemed to be new (then). I think they must have torn the place down and developed that little peace of serenity (within an inch of it's life). Sounds like the area at the top of 5th Ave. right at the border between Monrovia and Arcadia. Foothills Middle School (Arcadia) about a block west and Ralph's and Mc D's are a couple blocks west on Foothill. I don't remember the time frame, but the road north on 5th from Hillcrest now leads up to a gated residential area of large homes in Arcadia. 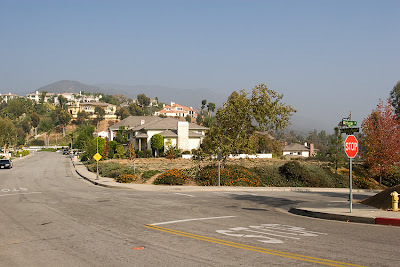 This Arcadia development was part of the motivation for Monrovians to tax themselves and buy up the vacant hillsides above Monrovia to make sure that never happened here.